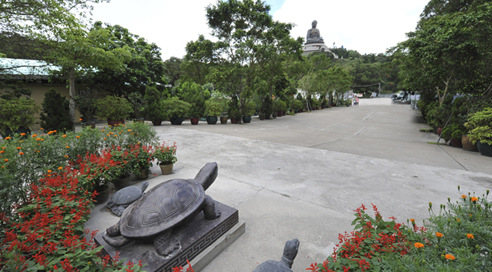 The Po Lin Monastery is situated on the plateau of Ngong Ping, on the gorges of Lantau Island, which is the largest of the over 200 outlying islands of Hong Kong. The Po Lin Monastery, nestled by the Lotus Peak, Lei Nak Peak, Lion Head Peak and Mount Muk Yue, resting between Lantau Peak, Hong Kong’s second highest peak, and Lei Nak Peak, stands at the highest altitude amongst all monasteries in Hong Kong. 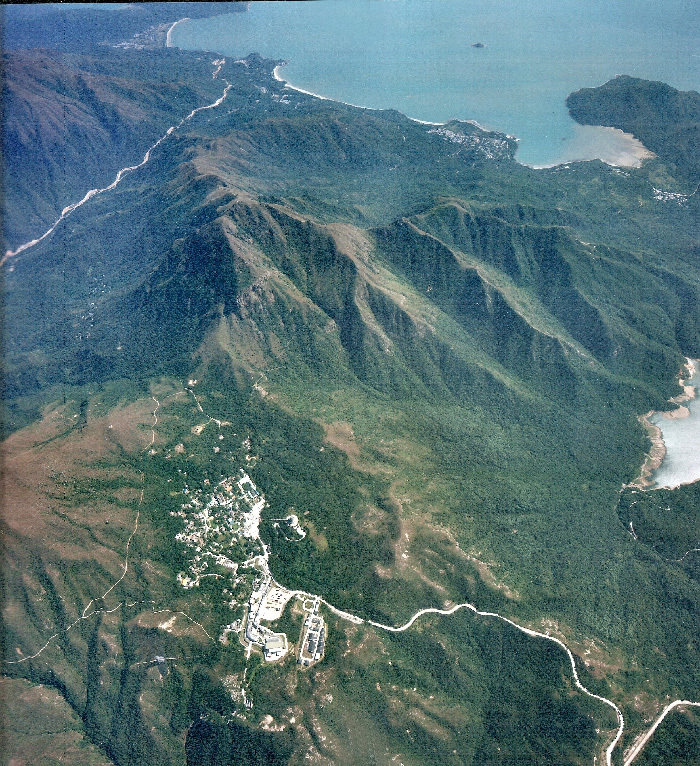 For its grasping geographical features, Ngong Ping is gifted with the renowned scenic spectaculars of sunrise from Lantau Peak, tea farm in the mist, lotus rocks, pagodas in enshrouding mountains, drumming rocks, and sunset in Mount Muk Yue. Sitting on this spectacular site, the monastery has developed progressively over the years. 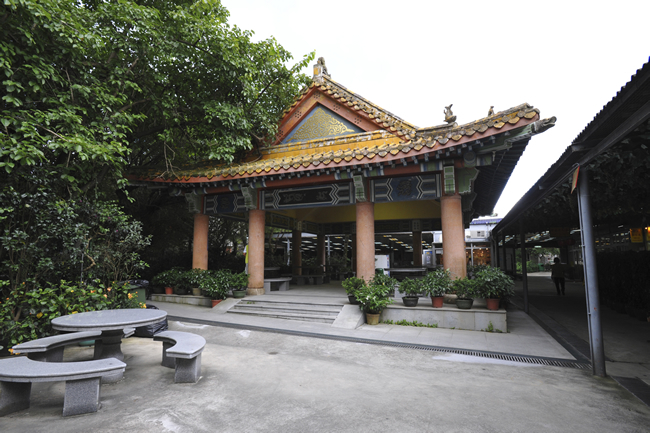 This, coupled with the building of the Tian Tan (Altar of Heaven) Big Buddha Statue, has made the monastery one of the renowned temples in the world. 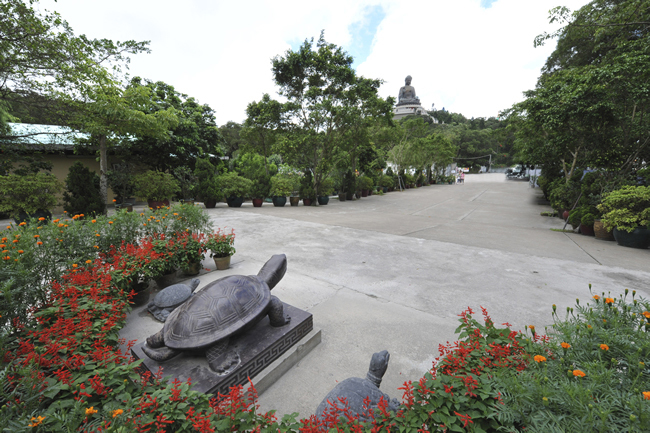 In addition to small patches of landscaping scattered around adorning individual buildings of the monastery, there are three major landscape gardens in Po Lin Monastery. 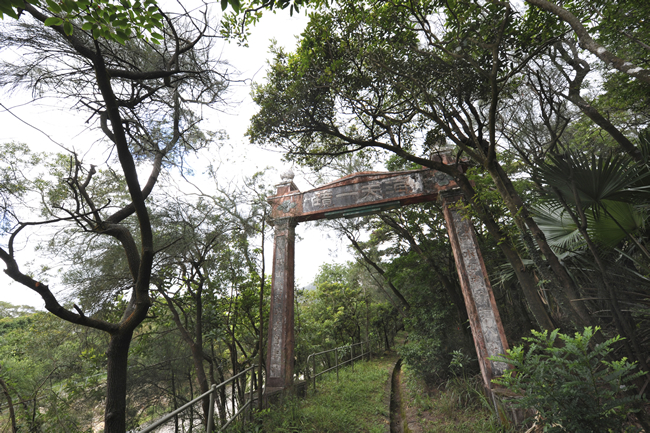 The first is the Bauhinia Park close to the Mountain Gate, established on the return of Hong Kong to China’s sovereignty, for the display of bauhinia, the flower of the Hong Kong SAR. The second is the Orchid Garden at the eastern side of the monastery where various species of potted orchid are cultivated and nursed with meticulous care to flourish, bloom and blossom all year round; the third being the second-growth forest, comprising primarily of red nanmu (of a species endemic to Hong Kong), in the garden at the back of the monastery, which is blessed with an aura natural of primeval forestry. 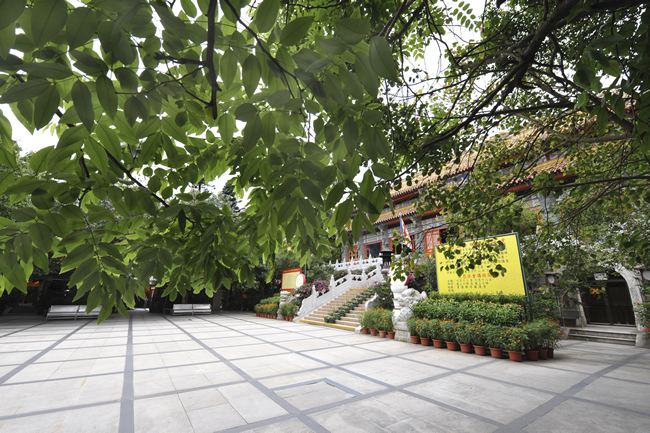 Abbots of the monastery have all paid great attention and have attached great importance to ecological values as well as the sustainability of the natural environment, and are all deeply entranced with the Chinese traditional artistic appeal and monastic concept of old temples in deep forests. 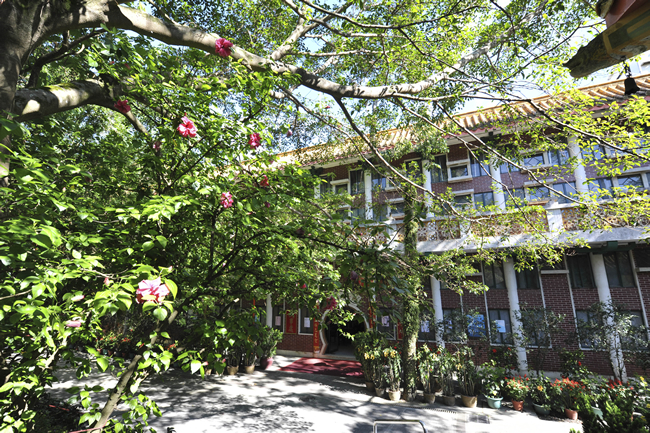 The first is the Bauhinia Grove. 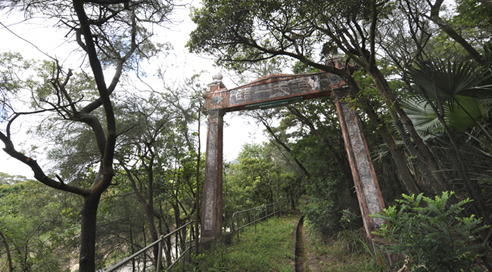 The original Bauhinia Park has been expanded, extending to the east of the central axis to become a large bauhinia grove, opening up behind the Mountain Gate. Bauhinia being the flower of Hong Kong is the emblem of Hong Kong SAR. A footpath, cutting through the grove, leads and directs to the inner sections of the monastery. 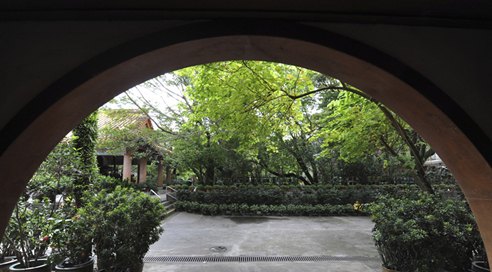 The grove is therefore a directional grove, giving the suggestive meaning of monastery in Hong Kong. Next is the Banyan Grove in the front court of the Main Shrine Hall. Large banyan trees are surrounded by potted bougainvillea and Chinese hibiscus high and low, dividing the large front court to smaller yards of green. Chairs and trestles are placed in the grove for visitors to take a short lull. Banyan is a native plant in South China. It is evergreen, growing fast and easy to cultivate. Small plants from saplings can easily grow up and flourish to form a grove. As for the third, a laurel grove is planned for the front court of the Grand Main Shrine Hall, now still under construction. Laurel is a slow growing plant but it blends well with orchid, which enjoys the shady shadows of the overhanging leaves of taller trees. When the laurel grows to become large trees, various species of orchid may be planted underneath them. The scented flowers of the two will combine to flourish and blossom year-round. For the shrine halls around, the fragrance of flowers will help sooth and purify the mind, enhancing the environment for worship and meditation. The fourth and last one at the end of the central axis is the garden at the back of the monastery. It is on an ascending slope, upon which are the tombs of Venerable Ji Xiu and Venerable Fat Ho, the first two abbots of the monastery. 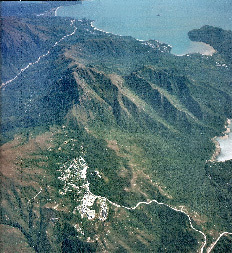 It is a large piece of land – a large second-growth forest comprising mainly of red nanmu trees. In recent years, evergreen Lohan pine (podocarpaceae) trees are cultivated and planted in the mix. A plan is also in hand to substantially plant ginkgo and other trees of miscellaneous species in this place. 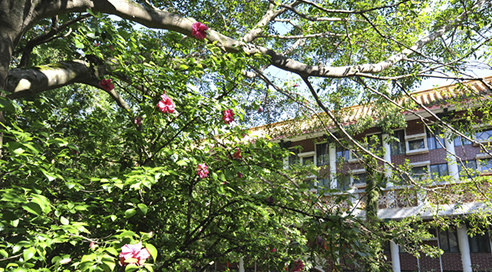 Ginkgo has its natural habitat in the areas north of the Yangtze River. The tree grows tall and has large crown and long branches, formed in a very beautiful shape. Its fan-shaped leaves will turn yellowish-gold in the autumn, providing a special touch in the otherwise bland autumn atmosphere. Ginkgo trees in the back garden will enrich the autumn scenery. They also symbolize the everlasting Buddhist teachings and Buddhist spirit. 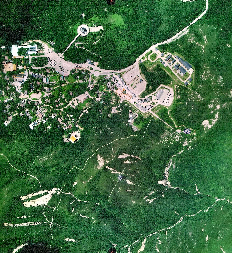 Small footpaths will be built cutting into the hill slopes to facility access to various spots of interest, through the groves of trees, and through the copses of flowers. It will be a small park in the hills for people to visit and see, to rest and relax, and to meditate and pay obeisance. 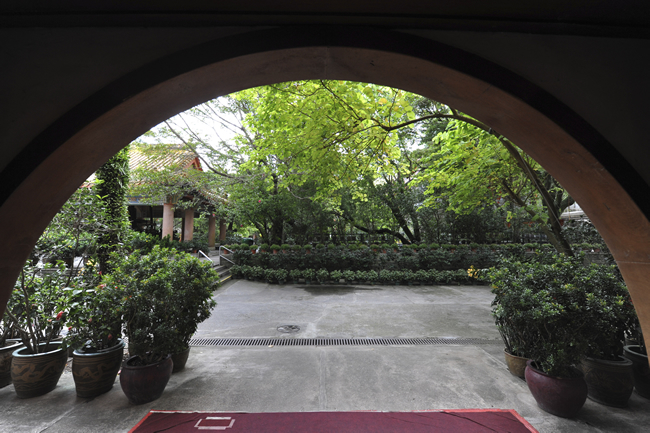 The four patches of green on the central axis of the monastery together forms a stretch of emerald-green, enchanted with scented flowers and bird songs: from the Bauhinia Grove, to the Banyan Grove, to the Laurel Grove, to the Evergreen Grove. It is the fusion of natural forestry and man-made growth, also a seamless blend of architecture and foliage. It is the embodiment of sustainable development and the concept of old temples shrouded in deep mountains in Chinese traditional monastic art. There are planted and potted flowers aplenty in Po Lin Monastery, adorning the sides of buildings, trees, terraces and platforms, balustrades and railings, footpaths and trestles. They are most notably orchids and bougainvilleas. There are various species of orchid, Chinese and European, with graceful long leaves and scented flowers, or with blooming flowers with colourful dancing, out-stretching petals. They blend and combine to flourish and scent all year round. The bougainvilleas would either crawl up along the walls or stand upright in the pots; or they would knit and weave with one another to form a lattice screen of flowers, creating space from one another; or they would be cut and clipped to various forms, like layering clouds. Orchid and bougainvillea have become the centre pieces of almost ten thousand potted plants in the monastery, decorating places, adding colour and vitality to the monastery. And there are fruit trees, including citrus, grapefruit, papaya, plum, lychee and mango. Citrus in particular has become the most proliferate, and is planted in profusion. Citrus fruits are used for offering, and also for food. By late autumn when citrus fruits ripen, clusters of golden yellow will hang from the boughs like golden eggs, adding an enchanting aura of autumn. 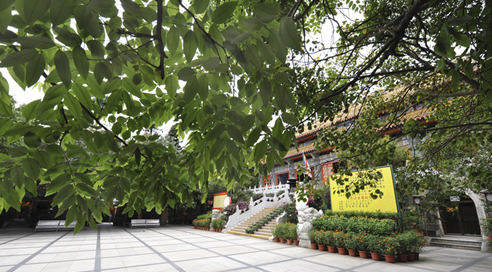 Po Lin Monastery has the largest number of fruit trees amongst all others in Hong Kong. It can aptly be described as a monastery ornate with flowers and fruits, filled with flowing scents of orchid and laurel. The Lotus Pond is situated on the left of the Hall of Bodhisattva Skanda. A round fish pond stands in the centre, measuring 6.1m in diameter, with a lotus petal-shaped fountain in the middle. 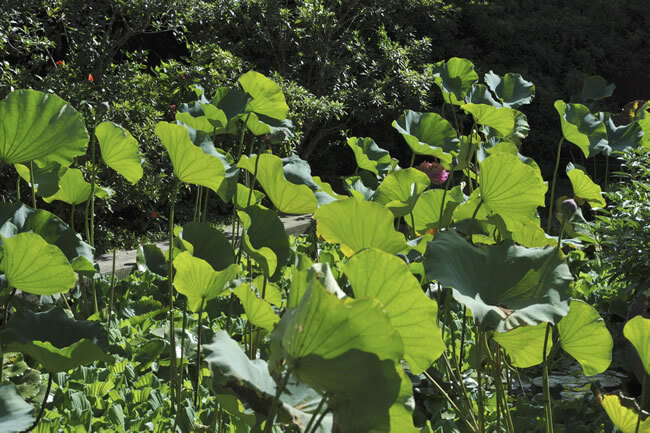 The fish pond is bounded by an encircling footpath, which is itself encircled by an outer pond planted with lotus and water lily. The footpath is accessible through a small bridge across the outer pond. 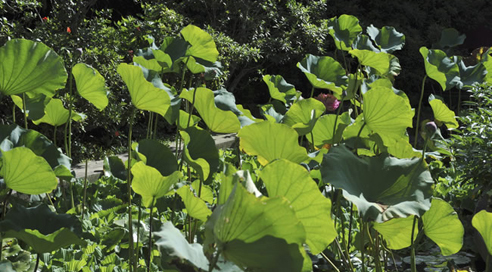 The term of Lotus Pond of Seven Jewels comes from Amitabha Sutra. In the Pure Land there is a lotus pond built and ornamented with seven jewels, gold, silver, lapis lazuli, crystal, agate, ruby and cornelian. The lotus pond is filled with pure water endowed with eight excellent qualities: purity, coolness, sweetness, softness, moistness, harmoniousness, with the ability to dispel limitless calamities such as hunger and thirst and the ability to nourish all good roots and make them grow. The quieting rippling sounds of water will help understand the true meaning of suffering, emptiness, impermanence and no-self. 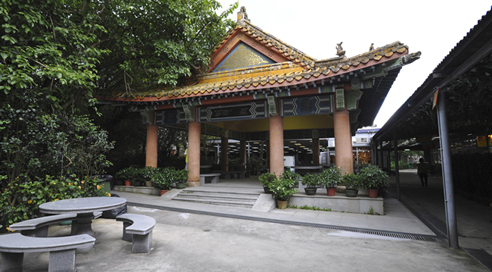 The Lotus Pond in Po Lin Monastery is material representation of the concept of Lotus Pond of Seven Jewels to help people in this world visualize the concept of good and virtuous in the Pure Land. It is a special Buddhist feature.